The long-term behaviour of glasses used to confine nuclear waste is of prime interest to ensure their safe geological disposal. 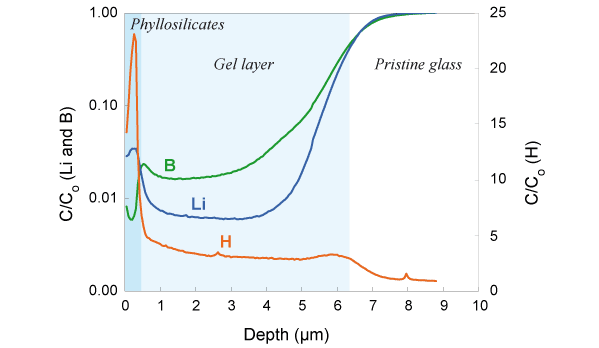 In order to understand glass alteration mechanisms, it is crucial to study the formation of altered layers (e.g. gel and phyllosilicates for silicate glasses) that develop in contact with acqueous solution. This requires elemental in-depth characterization as well as the use of isotopic tracers which is a powerful method to study the exchanges between the solution and the glass. Offering excellent depth profiling capabilities for low concentration elements and high precision isotopic ratio analysis, the IMS 7f-Auto is the best suited tool for analyzing nuclear glasses and investigating glass alteration mechanisms. Shown above are B, Li and H in-depth profiles for a glass altered after 3 months. The pristine glass displays high B and Li concentrations and a low H content. The gel layer is depleted in B and Li. Close to the free surface, H and Li enrichments are observed together with a B depletion. Concentrations are normalized to the pristine glass composition (C/C0). The IMS 7f-Auto is also used to perform meaningful isotopic depth profiles. In the same study, 18O/16O variations were measured, showing evidence of 18O incorporation via condensation reaction at the outermost part of the gel layer. Data from: N. Valle et al, GCA 74 (2010), p.3412.